In a statement to the ASX, AMP further downgraded its already weak profit guidance, reporting that its net profit for the 2018 calendar year would be “approximately $30 million” — 96 per cent lower than the $841 million profit reaped the previous year. Beaten up shareholders will see their final dividend crumble to 4 cents per share from 14.5 cents, while the company’s share price has more than halved since the banking royal commission started early last year. AMP is getting hit hard on the ASX today, with the broader market accelerating early gains to be up 0.7% or so, AMP has lost nearly 7% so far. The question is can AMP turn it around, with almost all its head cut off, can a new crew come in and displace the culture of avarice and greed? Only the bottom pickers will want any of this action, with even more headwinds for the financial services industry coming in 2019. So, what other ASX listed companies are in the same boat as AMP but are yet to be shown for what they really are? 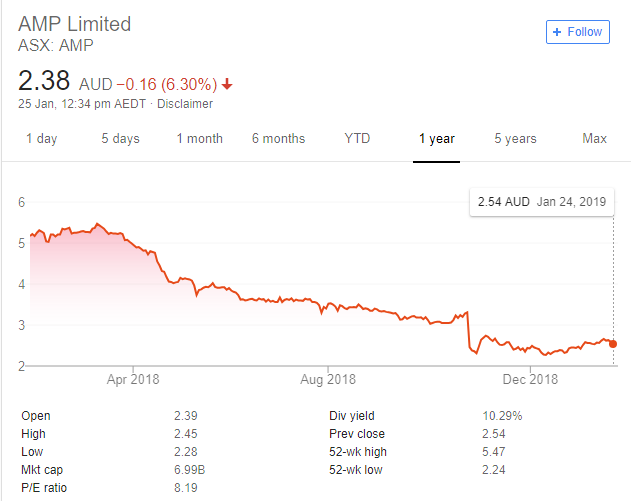 Someone yesterday on MB made what I thought was a very good point: when Kenneth Hayne hands his report to the GG on 1 February will the likes of AMP have to go into a trading halt / be suspended from trading on the ASX? Once the final report is handed to the government would anyone seriously believe that will be no leaks on any of Hayne’s findings. And any rumours of what those findings are, whether based in truth or in fiction, clearly will be price sensitive. Given the billions of dollars at stake belonging to hundreds of thousands of investors surely stocks such as AMP, IFL, NBA and CBA will have to be suspended from trading until the market is fully informed of those findings. As much as the government may be tempted to sit on the Hayne report until after the election I suspect they will need to release it very promptly or risk totally stuffing up trading on the ASX. It will also be interesting to see the ratings agencies response to it. Will they go down the line of, “The dirt has been exposed and reform is underway. Too big to fail; couldn’t be stronger!” or embrace the downside risk and reduce their ratings? My guess is they do very little, say very little and hope things work out OK in the end. Ratings agencies are part of the establishment. Rely on them for nothing. Of any value. I wish there was a Schadenfreude ETF, something like SHF if not taken. This ETF shorts companies purely for maximum schadenfreude. Maybe a mix of shorted stocks like. add afterpay and wisetech to the list! Hard to believe that AMP Capital and AMP Bank between them aren’t worth a big chunk of that $7 billion. Jason. My gut feel is that AMP Capital and AMP Bank are worth more than the current market cap of the parent, ie: the rest of the group has a negative net worth. But if you spin off the others, the rest can’t be worth less than 0 to shareholders. That said, APRA might have some concerns! With MB so negative on AMP it must be a raging buy going by MB’s past performance. With former CEO of CBA Mr Murray now at the helm of AMP what could possibly go wrong ? I like Shane. Shane is a bear. Bingo. He is the brand. i needed some caps on my teeth so i sold the bathroom door to pay for them…cool story eh? A true Aussie would have made caps out of the porcelain throne. Shares are more volatile because they are a claim on the cashflows after all expenses, including debt while the price of a property is before all expenses. Perhaps they should not waste billions on a swanky new building. Like putting silk sails on a sinking ship full of holes. It would be their property trust that owns the building. AMP capital I think. AMP parent will occupy a third of the tower and still need to find another major tenant. who is going to take over AMP? Unlikely that MQG are looking at it as they put a research report out on it today. The point being that if they were seriously looking at it they wouldn’t be able to put out research on it. Ooooh, is THAT what the picture is?! Thanks Bob! But what happened to the earlier post about a former NRL player doing the “bubbler” while he had a slash? I have some AMP shares, and a few minutes ago a steaming turd dropped into my email inbox from them that attempts to explain that things ain’t so great at the moment and don’t expect anything special from them anytime soon. I should’ve dumped them years ago. Oh well.